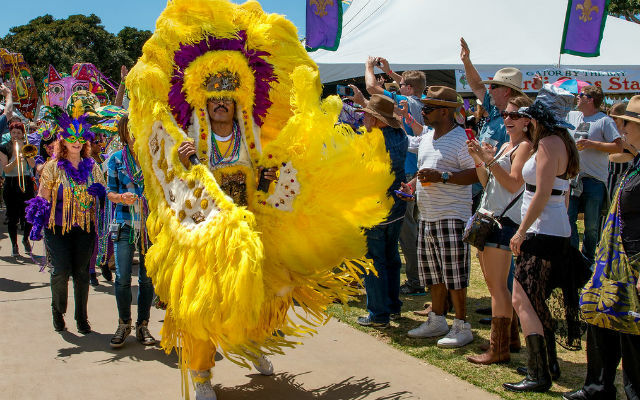 San Diego’s annual Gator By The Bay, a four-day Louisiana-themed music and food festival, kicks off Thursday evening at Spanish Landing Park. Presented by the Bon Temps Social Club of San Diego, the celebration features four days of live music with more than 100 musical acts and special performances on seven stages as well as an array of southern cuisine, including 10,000 pounds of fresh crawfish trucked all the way from Louisiana. Thursday, May 10: 6:00 p.m. – 10:30 p.m.
Friday, May 11: 3:30 p.m. – 10:30 p.m.
Saturday, May 12: 10:30 a.m. – 8:30 p.m.
Sunday, May 13: 10:30 a.m. – 7:30 p.m. Since its inception in 2001, the festival has grown to showcase a diverse selection of music genres including blues, salsa, Zydeco, Cajun and country. The festival kicks off with a concert double-headlined by blues vocalist Shana Morrison and Louisiana-bred Sonny Landreth. Morrison, who started her career in her father, Van Morrison’s, band is known for musical stylings of pop with a side of blues and rock which has brought her international acclaim. Landreth, known as “King of Slydeco,” has developed a unique guitar style that has captivated audiences across the world. Thursday night concert tickets range in price from $35 to $95. Daily festival tickets range from $35 to $40. Three- and four-day passes are also available. More ticket information is available online.